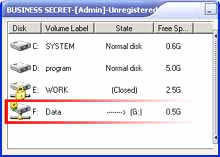 Bussiness Secret - This program create encrypted area(secret disk) in your hard disk, to keep your private and confidential data secure. Bussiness Secret - This program create encrypted area(secret disk) in your hard disk, to keep your private and confidential data secure. you can dynamic mount/unmount this secret disk by hotkey or mouse on anytime. this is very easy-to-use, reliable, user-friendly and smart program.